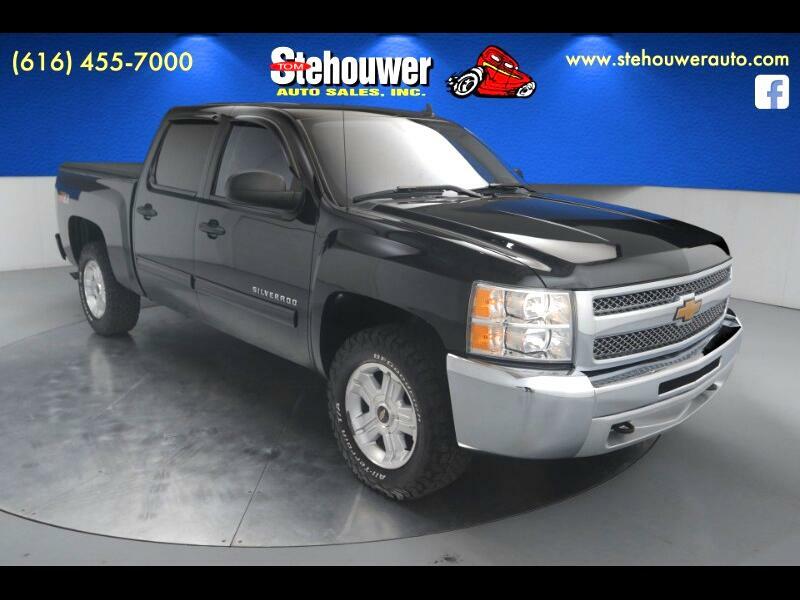 2013 Chevrolet Silverado 1500 LT 4WD Vortec 5.3L V8 SFI VVT Flex Fuel 6-Speed Automatic Electronic with Overdrive Clean CARFAX. Actual vehicle shown!, 6-Speed Automatic Electronic with Overdrive, 4WD, ebony Cloth, 17" x 7.5" 5-Spoke Aluminum Wheels, 6 Speaker Audio System Feature, All-Star Edition, AM/FM Stereo w/CD Player & MP3 Playback, Bluetooth® For Phone, Body-Colored Bodyside Moldings, Chrome Grille Surround, Color-Keyed Carpeting w/Rubberized Vinyl Floormats, Driver & Front Passenger Illuminated Visor Mirrors, Driver-Side Manual Lumbar Control Seat Adjuster, Dual-Zone Automatic Climate Control, Electronic Autotrac Transfer Case, EZ-Lift Tailgate, Heated Power-Adjustable Black Outside Mirrors, Heavy-Duty Rear Automatic Locking Differential, Heavy-Duty Trailering Package (Retail), Leather-Wrapped Steering Wheel, Locking Tailgate, LT1 Equipment Group, Power Door Locks w/Remote Keyless Entry, Power Windows w/Driver Express-Down, Remote Keyless Entry w/2 Transmitters, SiriusXM Satellite Radio, Solar-Ray Deep-Tinted Glass, Steering Wheel Mounted Audio Controls. Odometer is 11336 miles below market average!